We’re baaaaaaaaaack! What is it about camping holidays that makes them seem simultaneously too long and too short? It’s very odd. Anyway, the weather was fab (thank goodness), the chickens were laying (and taunting the tethered puppy with their just-out-of-reachness), and the kids had a marvellous time. I could have done with a bit more in the way of isolation – I had a phone signal the whole time – but never mind. I was very glad to get home to the big pile of fabric I had cut up for dressmaking just before we went away. 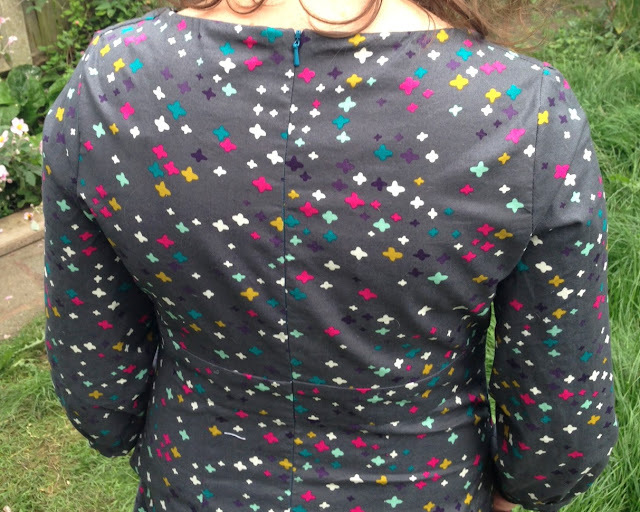 First up was an Ashland Dress (pattern bought almost a year ago) in Koi. I chose this pattern because it comes in different cup sizes, and I often have a problem accommodating the ladies. One thing I will say, however, is that there is no information included about determining which is the right size to use. I went with the ‘D’ (I am a UK ‘E’ cup) and there is way more room than I need. I guess things work a little differently Stateside. Anyway, better to be too loose than too tight. There are quite a few options with this dress – sleeveless, and elbow-length or 3/4 length sleeves, as well as patch or inseam pockets. I chose the 3/4 sleeves and inseam pockets. There is meant to be a sash on the back, but I didn’t bother with that. I’m not a big fan of sashes because they are usually uncomfortable to sit against. 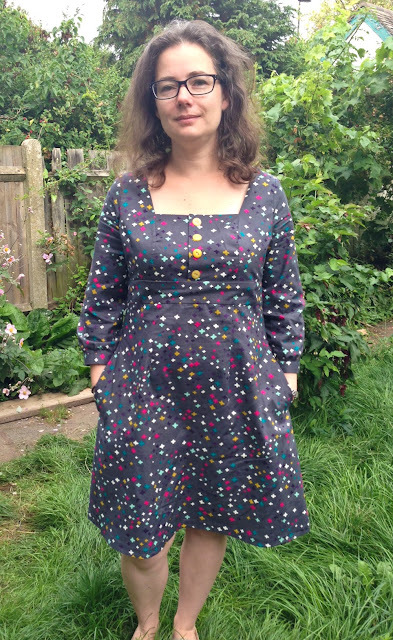 I also made the bodice and waistband in different sizes (my narrow back and chubby middle do not generally agree on a single dress size) and managed to grade things quite well. I am quite proud of myself. One thing I would say is that the dress is quite short. I am only 5’2″ and it sits just on my knees (with a smaller than suggested hem). Could be worth bearing in mind if you want something a little longer. I am especially pleased with the invisibleness of the invisible zip. It was only the second time I have installed one, but the instructions were really well written and made it very straightforward. Apart from the sewing it on backwards bit. That was entirely my fault. 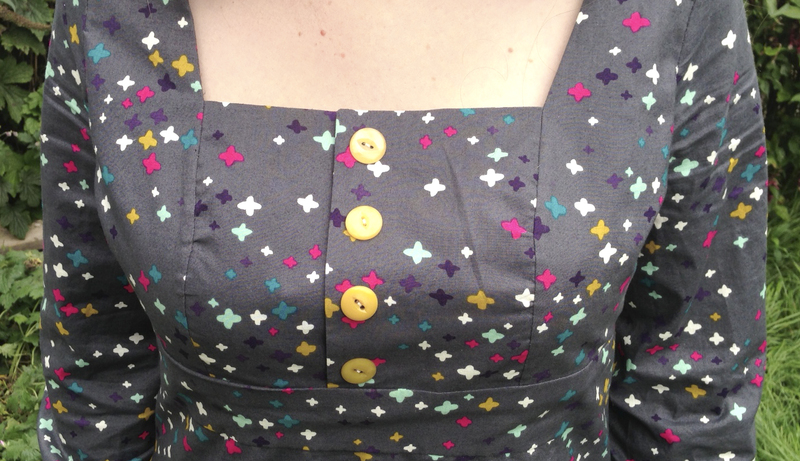 And I actually managed to find the perfect set of buttons in my stash. That almost never happens. I am hoping to get a decent amount of wear from this during the Autumn – I think it will look really cute with tights and boots. Bring on the chillier weather, I’m ready.